Self-image | My Health! My Choice! 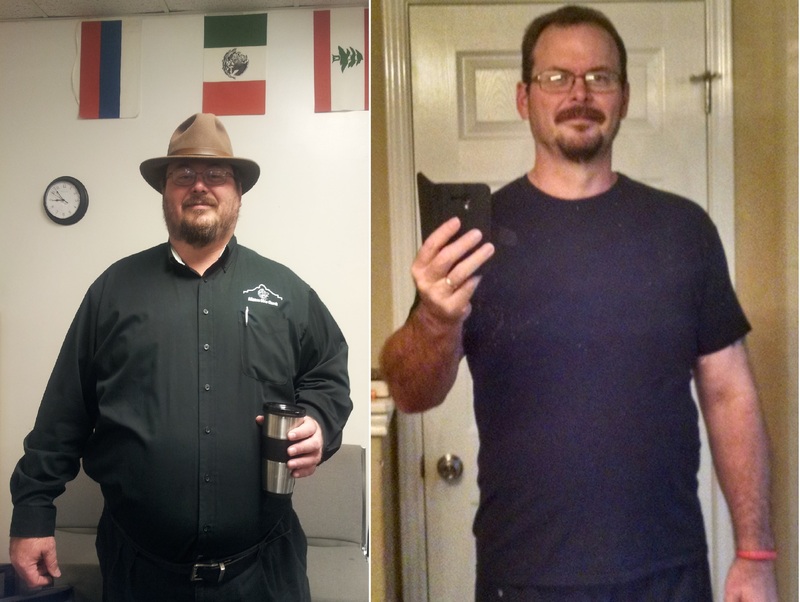 When I returned to my program, on September 6, 2015, my weight had gone back up to about 278 lbs. (about a 23 lb. increase, with most of it after rotator cuff surgery). I remember it being within a pound or so of that, but didn’t take a photo. Part of the reason for not taking a picture is that I wanted to get back into fat burn and properly hydrated before reporting my weight. The reason for waiting until properly hydrated over several days is because (as I reported in the past) my weight will differ by as much as 5-7 lbs. Inflammation, as joints and organs hold water to maintain proper function adds weight. There is also the additional weight of a full bowel—sorry to share that. 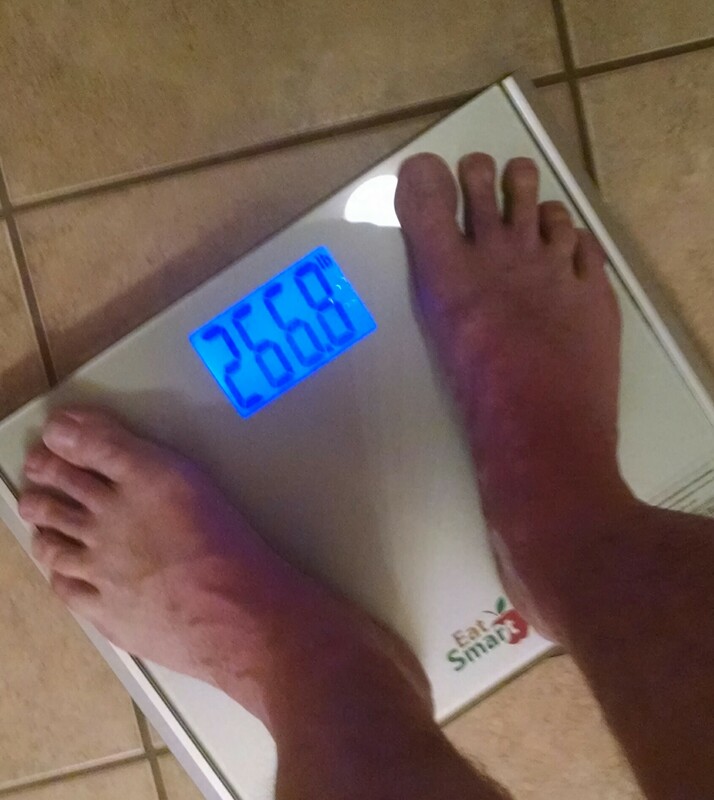 This past Sunday (September 13) I weighed in at 266.8 lbs. This might seem like a large drop for just one week—which it is—except that it likely includes additional loss for the above reasons. However, I usually lose very fast on this program, at least for the first few months. After several months my metabolism will slow down to compensate for the long term calorie count. But in the first few months my body happily burns major fat. A couple days in, I stopped feeling any hunger pains. There was the occasional grumbling tummy, but that will come and go any time. After three days, I was in fat burn and my energy levels were back up. My motivation is high and I am very pleased with the program. This actually brought up some thoughts about another time I tried to go back on program. Last spring, for various reasons I decided to go back on program and, a week or so in, I became terribly depressed. It really came on suddenly. It was also quite extreme. That is one of the reasons I dropped off the radar blog-wise. It got bad enough, that I thought I might need to seek help. I’ve used traditional and over the counter methods for years to counteract depression, and they usually work very well (I’ll share some later). This past spring nothing seemed to work, except for dropping off of program. Even that only brought me out of “the deep dark”, into the “not as deep and dark.” I was still fairly depressed. There was an element of it that continued until recently. This helped me to figure out what happened. Low Carb diets can affect our serotonin levels and cause lowered moods—and for some even a depressive mood. I don’t want to say it can cause depression, because depression is something medical. If you suspect depression, see the doctor. I can talk about moods and recommend ways to improve those, but really am not offering advice on depression. I am only offering what I have learned about myself. Please take it in that spirit. I went back on program right about the same time that there were some new stresses in my professional and personal life. Those stresses and the program joined up with it being the time my doctor lowered my testosterone dose by a third to see if my body would make up for it. It didn’t. Instead I got very low on T-level, and only recently found that out by my latest blood tests (I’ll share some of what I’ve learned about testosterone later). The doctor recently raised my dose back up and confirmed this as the cause of my symptoms. It’s been a while since I posted a before and after photo. I took a selfie this morning and edited it into an old photo that was taken right around the time I started my program. Over the last few weeks I’ve transitioned off of the weight loss regiment I was on, and am now concentrating on weights and increasing muscle mass. Once I get where I want to be there, I’ll go back to burning fat down to my desired weight. The changes, both physical and psychological, are hard for me to take in. I compare today to back then and I can’t fathom how I ever got that way. Even though I am no longer in fat burn, I don’t have cravings like before. Yes, at times I just want something to eat. However, I don’t want sweets or crave carbs. When I was heavy, my Kryptonite was Ice Cream. The only ice cream I’ve had since Easter was about a month ago when I was experimenting with Bananas Foster and I had it twice, with no need to have it again. Personally, I don’t care if I ever have it. I used to love beer. I still love the taste of it. But it dawned on me that I no longer care if I ever have another. I have to admit that at times I have to eat things I would not ordinarily eat on my current eating plan—or any healthy eating plan. For example, a few days ago I was at a meeting where the choice for lunch was sandwiches or sandwiches. So I figured I would have to order a sandwich. However, there was a problem. I shouldn’t have bread. I don’t want to go back to the carb cravings. About 10 years ago I lost a lot of weight on the Atkins diet and when I dropped off I went into major carb consumption mode, eating so much bread, pasta and sweets that I quickly gained the lost weight back with an additional 25 lbs. I see where I am now, and where I used to be and I do not want to go back. So, you might be saying “Then eat the filling and throw away the bread.” I have always had a hard time doing that. I can give you several reasons why I went ahead and ate the bread, but none of that really matters. I chose to eat the whole sandwich—I chose a 6” rather than a 12”, at least. The nice thing is that I find at such times, when I allow myself to eat things that aren’t the best choice, I don’t enjoy them. I find myself thinking about what could happen. I find myself wondering what it might be doing to my hormone balances and what I may have to do to bring things back into proper state. Will I start craving bread? Will I need to go into Ketosis again to balance things back out? I know many reading this will take exception to that. Most people don’t want to give such thoughts to their food and their health. We want to be healthy, but we want to be mindlessly healthy—no work, no thought, no learning; just “eat, drink and be healthy,” if you will. The problem is that with our lifestyles and the foods available to us, this is just not possible. We live in the most blessed time ever in human history—especially if we live in the United States. If I wanted something to eat at 2 AM and had nothing in the house, I could get out in my car and drive to any of a hundred places in our city that will still be serving. We have 24 hour a day groceries and fast food. Food is everywhere. Neither are our foods today really tied to seasons. I’ve walked in the grocery store in February and found piles of watermelons for sale. When I was a kid this just wasn’t possible. You got certain foods when they were in season and you wouldn’t see them again until the next harvest. I remember in 1989, when my wife was expecting our middle child, she wanted watermelon and asked me to go get her some. Problem is that we were in Korea, it was March, and it was the middle of the night. I got out and scoured the village market finally finding a small shop with some small (tiny) watermelons. The shop owner was not happy to be woken by a big American banging on his door wanting a watermelon—good thing I spoke enough Korean. That little bitty watermelon cost me hours of searching and $20 (in 1989!!!!). Not to mention the cost of the taxi because it was freezing outside. But my wife got her melon. We no longer have these problems. If I really want anything, it can probably be quickly and easily found. Not too long ago, most communities only had a few ethnic selections. I grew up in Fort Worth and there was our food or Mexican food. If you wanted something really special there was also a German restaurant in town. Of course, there were likely others. But we just did not have the exposure to other foods like we do today. We can find the richest, most decadent, most enticing foods from all over the world and drive no more than a few minutes. This ready access to abundant foods is not the only change. Few of us work as hard as our ancestors did. I spend most of my day working behind a desk. My father spent his days roofing. My maternal grandfather spent his days behind a plow. Yes, some still work hard. But even our hard jobs today are easier with the many labor saving devices we have created. I still remember watching a home improvement show with my wife years ago. She had never seen a nail gun before. She asked what it did. She thought maybe it made a hole for the nail. When I told her it actually shot a nail into the boards like a gun so there was no need to swing a hammer, she said, “Americans! Always finding an easier way to do everything!” Well, it’s true. We do find the easiest and most efficient way to do things. Even when we work hard, we don’t work as hard as our ancestors and don’t burn as many calories as they, so what makes us think we can eat like they did? Back when food was limited to what was readily available and when work was hard and toilsome we could simply eat whatever was available and whatever amounts we felt like eating. Some foods had to be intentionally carb and fat heavy in order to get enough sustenance. This is no longer the case for us. We have to think differently about our foods. We have to think differently about what we put into our bodies. We need to learn about our bodies, and our needs. We need to understand what each bite can do to us. I am a detail guy. I overthink everything. I like to know ‘the nuts and bolts’ of things. I find articles in magazines and online. I read books on the subject. I am trying to lay down a foundation of knowledge that will help me to make quick healthy choices in the future. In time, these choices become second nature. Don’t just let your health (or ‘un-health’) happen. Take control of your body and of your life by first taking control of what you eat. However, you cannot control what you eat unless you first understand what you eat. You have to know what is healthy and what it unhealthy and, if you are like me, it is helpful to also know why. Commit yourself to controlling your food and not being controlled by it. For most of us health is not going to just happen. It takes effort to attain, and effort to maintain. Since losing so much weight, my personal interactions have changed. People seem to smile more, approach me more and want to interact more. While it is easy to assume that this is because they “like” me better now that I am lighter, that assumption would actually be too easy. There are several possible reasons for such an experience, some external, some internal, but all positive. First off, it is possible that some find it hard to be friends with someone weighing over four hundred pounds, as I was. There are those who are repulsed by such people. I know, because I’ve had people tell me my weight repulsed them. Because of this I know some in the past may have been unable to be friendly with me. In that case, reducing my weight so that I do not repulse is a good thing—especially for someone whose calling in life involves trying to attract people to a faith community. Being overweight handicapped my career for years. It got in the way of personal interactions, because some people would be repulsed by my weight. I even had one couple tell me they were leaving our church because I was so fat. Now, don’t feel I am being too harsh with myself and try to make me feel better about how heavy I was. It was understanding exactly what I had done to myself that inspired me to work so hard to lose the weight. It was the problems my weight caused me professionally and personally that caused me to really want to get rid of it. Jesus said, “The truth will set you free.” This includes painful truth—actually painful truth is probably the most freeing truth out there. The previous thoughts all touched on the effect of weight loss on other’s perception of you. However, there are also internal reasons for a difference in relationships that are impacted by weight. The biggest would have to be self-image. I am a very outgoing, and very friendly person. I love to talk, to laugh, to tell jokes and stories. Actually, being a Texan means I have a license to stretch the truth into any form I want so long as it makes for a better story. It is a skill learned at the feet of our elders, and as such is an honored practice to be honed to perfection. However, over the years, as my weight ballooned higher and higher I found friendly interactions harder. When you do not take yourself seriously and cannot see yourself as anything but repulsive it is hard to interact with others. You find yourself wondering what that person must be thinking of you. You find yourself questioning that person’s motives for every action. This problem then works itself out in your actions and expressions. You often hear that animals can smell fear. Well, humans are pack animals used to interacting in very subtle ways. We give facial, pheromone, and body language clues even when we do not speak. Then when we open our mouths we give clues with speech cadence, pitch, tone, and voice that share how confident we feel (or do not feel). These spring naturally from our self-image. For example, some studies show that when two males converse, the voice of the more dominant will deepen and the voice of the more submissive will rise. This is unconscious and deeply ingrained. Even picking up on the difference is automatic—even the youngest children respond without knowing why. This means that much of my perception of problems with personal and professional interactions when overweight sprang from my own self-perception. One, it would cause me to question the response of the other person—which only served to reinforce that negative self-image. It would also cause me to speak and act in ways that reinforced their poor image of me. Losing weight has caused me to see myself very differently. This causes me to respond differently to others—which is really responding to my own self-image. Losing weight can radically change personal and professional interactions. These interactions and relationships are part of human health. Having a healthy body helps to have healthy relationships. You will be taken more seriously. You will be seen as self-disciplined. You will project a different image to others. You will project this different image because you will be different. Don’t wait. Start now to transform yourself and your future. Do it for yourself, but also do it for the impact you can have on the lives of other people. I am sure you have something positive to add to the lives of those around you. By losing weight you give them more reason to listen and give yourself more opportunities to speak into their lives. wendya831 on Magic Pills? None exist!